Temperatures may be mild right now, but it’s the perfect time to clean out your gutters! Cleaning out your gutters is important to keeping your home safe from several potential issues that can lead to larger problems down the line. Below are reasons why it is important to clean out your gutters of any debris leftover from winter. 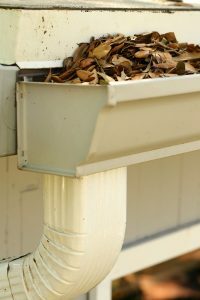 Clogged gutters prevent water from being able to properly flow through your downspouts away from your home. As water builds up in your gutters, it will begin to overflow, dripping down the edges and along your exterior walls. Since the water will not be directed away from your home, it will pool around the foundation and stay until it is absorbed into the ground. As it stands along your home, it will erode at your foundation, forming mold and cutting away at the materials. This can lead to structural problems with your home and decreased value when it comes time to sell and move. As winter progressed, debris was most likely blown into your gutters during storms, leading to clogs and weighing down the unit as it hangs on the edge of your roof. As the gutters are weighed down and begin to buckle, damage will begin to occur along the edges, affecting your shingles and rafters and leading to leaks in your attic. Persistent leaks may breach your attic and start affecting the rest of your home. If rot is sustained long enough, parts of your roof can weaken enough to allow critters to enter your attic, leading to an infestation of your home. If pests begin to move into your home, you will require a pest removal service to make sure they do not nest inside the walls and cause further damage. If you want professional help cleaning out your gutters this spring, contact Flannery’s Handymen today! We will schedule a time to come assess and clean your gutters and keeping your home safe. Flannery’s Handymen can be reached by calling 781-775-9943 or by filling out our online contact form.